YOUR PET NEEDS DENTAL CARE TOO! At The Vet Clinic, Inc., we understand the importance of maintaining a clean and healthy mouth for your pet and how doing so can increase the quality and length of life for your four-legged family member. In fact, Dr. Sara has made pet dentistry her passion and wants every pet to experience the benefits that come with routine pet dental cleanings and other pet dental services. The staff is also well trained and experienced in the field of pet dentistry and works hard to make sure that each patient and their owner is comfortable with each procedure. Does your pet have bad breath? Have you noticed any loose or discolored teeth? It may be time to schedule an appointment for a dental check-up for your pet. 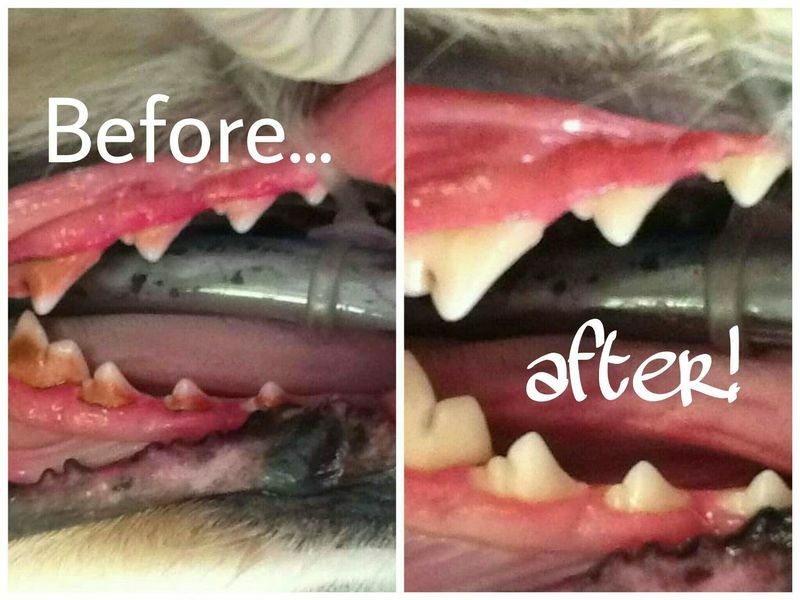 Our pet dentistry services include digital dental x-rays and routine pet dental cleanings and polishing. We use an ultrasonic scaler for cleaning and a high-speed polisher with handmade polish. We also offer sealants to prevent bacteria and tartar from sticking to teeth for up to 6 months. We can also perform extractions as needed for teeth that are too sick to be saved. We use some unique equipment and strategies when working on your pet's teeth! Digital Dental Radiographs – these help Dr. Sara find problems under the gums that may not be seen by visual inspection of the mouth. Did you know 70% of each tooth is below the gum line? High Powered Drills – they make extractions a breeze. Hot Dawg – this is a special blanket that keeps your pet warm while having his or her teeth cleaned. After pet dental procedures, we offer laser therapy on the gums to decrease pain and inflammation and to promote healing. This is done while the patient is still asleep. Rest assured, we have the very best equipment to provide the pet dental service your pet needs. In fact, we have the same equipment that your dentist’s office and surgical suite would have. We also follow the American Animal Hospital Association’s Oral Healthcare Guidelines to provide your pet with the best possible dental care. For more information, you can visit AAHA's website to view the Dental Care Guidelines for Dogs and Cats. LET’S GET YOUR PET’S DENTAL CARE STARTED! Are you ready to get your furry friend’s dental care started? Give The Vet Clinic, Inc. a call today at (870) 425-0035 to schedule an appointment. Because each pet is different and unique in their own special way, a designated appointment is best and will give you time to ask questions. Have questions? We understand that you want what is best for your pet, but we also understand that any procedure can be a little stressful for the pet owner, especially when it involves general anesthesia. We work hard to answer your questions, let you know what to expect, and even keep you updated throughout the day of the dental procedure.